Get the Smile of Your Dreams with Clear Braces in Norwood! Does the thought of posing for pictures give you anxiety because you’re ashamed of the way your teeth look? Have you been living with a misaligned bite for years? If you answered ‘yes’ to either question, then the time has come to make a change. Finally, there’s one available that offers an alternative to the traditional braces method – the Inman Aligner. As you read on, you’ll learn about the benefits of clear braces in Norwood. The Inman Aligner is the perfect mesh between the worlds of orthodontics and cosmetic dentistry. A form of invisible braces, it provides a new and improved way to correct your bite issues. It consists of custom-made trays that include a front, plastic piece that fits your teeth comfortably and adjusts as the treatment progresses. 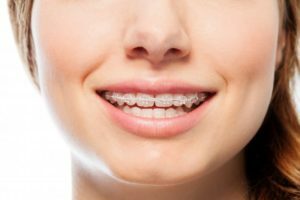 One of the major benefits of this procedure is that it offers a discreet way to correct your bite, minus the metal brackets that are common with traditional braces. Still, there are other perks that make this process very attractive. Less Treatment Time – Typically, when wearing traditional braces, the process to takes at least 24 months. With Inman Aligners, the more direct pressure that’s applied to your teeth will produce faster results. Some patients can have their smiles completely corrected in as little as six months. Convenience – One of the many great features of clear braces is that they can be removed throughout the day for eating and performing your normal oral hygiene routine. Keep in mind, though, that they must be worn between 16 and 20 hours a day to stay on track with the treatment plan created by your dentist. Comfort – With your clear braces, you also won’t have to worry about having wires irritate your cheeks or enduring the traditional manner of having adjustments made. To get the process started, reach out to your local dentist to schedule a consultation. While there, the expert can examine the current condition of your smile to determine whether you are a good candidate for Inman Aligners. Once it’s established that it’s right for you, you can get on the road to smile perfection! Dr. John T. Michaels earned his dental degree from Ohio State University Dental School and has gone on to take over 1,000 hours of continuing education in a host of modalities, including orthodontics. He helps patients achieve the smile of their dreams at Norwood Dental Care, voted the best in the region since 2003. Dr. Michaels can be reached for more information about his services through his website. Comments Off on Get the Smile of Your Dreams with Clear Braces in Norwood!